Composting is becoming more and more popular. 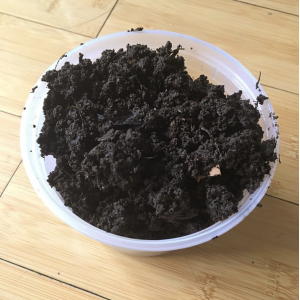 Though I personally had some mishaps at first, I find it deeply satisfying to turn food scraps into deep, dark, nutrient-rich compost – a simple alchemy. Composting has some massive environmental benefits, too. But how can a person with limited space or limited time take advantage of composting? 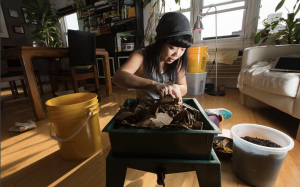 We’ve enlisted an amazing composting expert to tell us what we need to know about how to get started and have success at composting, Rebecca Louie, author of the book Compost City: Practical Composting Know-How for Small Space Living. She is also know as “The Compostess”. Rebecca is a certified New York City Master Composter, and spends her time between her New York City apartment and a cabin in the woods. I am grateful to Rebecca for sharing her knowledge with us. What is the basic process of composting, in its most simple form? It’s essentially human beings replicating what nature does. There’s a recipe for it, like for cookies. You take dry carbon rich materials (dry leaves, hay, straw, paper, cardboard, eggshells, sawdust, etc. ), and add it to wet nitrogen-rich materials (vegetable and fruit scraps, grass clippings, coffee grounds, plant clippings), etc. Make sure it has a balance of air and moisture, and let the little natural critters and microbes do their thing to break it down into compost. Compost is a “soil amendment”. It infuses the root system for plants with everything they need to grow, organic nutrients. If you have poor soil quality in your yard or potted plants for example, you might find that water runs right through it. This type of soil isn’t very healthy, and plants suffer because of it. Compost creates pockets for air, allows the soil to hold moisture better, and provides nutrients to plants as they need them. It is also an amazing food source for other creatures – fungi, bacteria, and worms, which further break down things into micro nutrients for plants and other creatures. Manmade fertilizers such as Miracle Grow might provide a pop of nutrients, but it doesn’t create the equivalence of health. These synthetic fertilizers are like Red Bull to a plant — and jolt and nothing more — and then whatever isn’t absorbed by plants leaches out. Compost provides organic nutrients that are released slowly and naturally, and provides an ecosystem for the microbes and invertebrates that are essential to soil health. Composting also saves money. You can reduce your water use as healthier soil requires less water, and you don’t need to buy commercial fertilizer or bags of garden soil. You’ll also see a reduction of what you bring to the dump, which means fewer fees. If you don’t have a garden or plants to put compost on, what’s the point of composting? Food waste creates a lot of trash. It is estimated that if everyone composted their scraps and other compostables like yard waste and paper, we’d have more than 1/3 less waste in our landfills. Items that can be composted but aren’t require a lot of trucks transport it — all of which burn fossil fuels that harm our environment. Once it gets there, it ends up decomposing anaerobically in plastic trash bags creating greenhouse gases or leaking ammonia that leaches into our waterways. Diverting food and yard waste and paper materials to compost is not only good for the soil but good for the overall environment. Plus, it’s a fun thing to do – kids love it. It also brings the community together – there are many shared gardens and schools where compost is created as a group activity., This creates relationships and builds community. What kind of equipment and space do you need to compost? There is a perception that composting has to be sweaty and laborious. I can assure you that there is a composting system for every lifestyle, budget and space. You can live in an apartment with six roommates and five cats and still compost discreetly, neatly and effectively! It comes down to what your goals are, what amount of waste do you create, and how much can you reasonably compost. I generally advise to start small, get familiar with the system you choose (there are a lot of them) and as you get more comfortable, scale your efforts. If you try to overdo it with an overly ambitious plan, you may not be able to keep up with items as they decompose. That’s where you can have problems, and good systems go bad. Instead, be realistic. There are composting systems that fit every lifestyle, no matter if you require a lightweight system, you have special needs, or have space or budget limitations. While compost methods have a commercial product versions you can buy — like bins, tumblers, and digesters — there are also do-it-yourself solutions that save a lot on cost. There is something for everyone. City dwellers don’t always have much space. What’s your advice to someone with a small space on how to compost successfully? I live in an apartment in Queens that is by no means large, and I use three main methods to compost there. My worm bin is a glorified storage tub drilled with air holes. What you do is place carbon rich materials, such as newspaper and non-waxy, uncoated paper in the bin and wet it to the point where it feels like a wrung-out sponge, the add carefully controlled portions of fruit and veggie scraps. Then you add a particular type of worm called Red Wigglers, about one pound per 8-10 gallon bin. Start feeding them a 1-2 cups of food scraps at a time to see how quickly they consume. As tempting as it is do not overfeed your worms! Give them their next portion as you see the previous one disappearing. Worm bins are great for kids, as they can be used as fun, interactive teaching tool around sustainability and ecology. They love it, and they are becoming more common in schools and other kid community hubs. 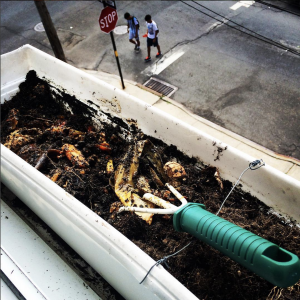 I have window boxes around my windows outside my apartment and during the non-growing season, I bury food scraps in them, like banana peels, coffee grounds, and onion tips. The ecosystem already present in the soil breaks them down. 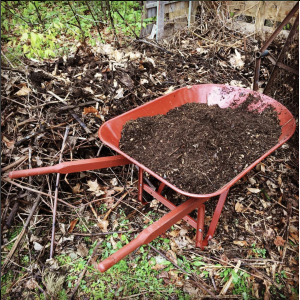 This is a form of mini “trench composting,” more commonly done in yards, where you bury scraps directly into the soil and cover them up with several inches of soil to serve as an odor and pest barrier. In the spring, I get lots of seeds sprouting and I give the seedlings away to people and the nutrients feed the soil that I now plant in. Currently, I’m brimming with melon and pepper seedlings that all volunteered to grow in my window boxes and passing them out to colleagues and friends. 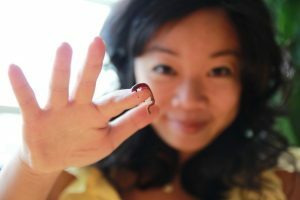 I started using a method of preparing a range of food waste types for composting called Bokashi, which is the fermenting of food waste in an airtight bucket. What you do is you add food waste in a layer at a time and sprinkle a dry substance, often wheat bran, which is innoculated with a trio of amazingly powerful microbes. The advantage of the Bokashi method is that you can eventually compost things that you typically should not go in an aerobic composting system, like meat, dairy, cooked foods, and weird condiments because they tend to get funky, attract pests, and can inhibit the health of beneficial creatures (earthworms, for example, will not thrive in a very oily, salty pile). 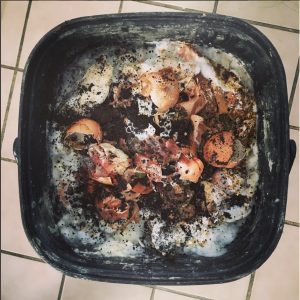 It is a two-step process – first you ferment the food scraps and then you bury them. While it does not smell when the airtight bucket is closed, it can be funky when you open it. Think, “fermenting steak.” You may want to have the windows open! What about yard composting? What options do people have? Like with indoor composting, each outdoor option has a commercial version you can buy and also a way to make your own and do it yourself. There are a few options for outdoor composting. 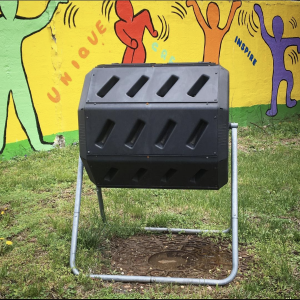 This is a type of lidded outdoor composter that is largely underground. It’s submerged about ⅔ into a hole in the soil, and has holes in the sides and bottom for the soil ecosystem to enter. When you’re ready, you open the top and put in the scraps. It’s like a tunnel to the underground. With this version, you don’t have to worry so much about the carbon to nitrogen recipe because the scraps are deposited directly underground and the lid keeps odors in — you just stick your scraps in there and close the lid. These are spinning containers that help make it easier to turn your compost. While turning isn’t essential to successful composting, it does help mix the browns (carbons) and greens (nitrogens), aerate and distribute moisture, and get you in tune with what’s happening at different levels of your bin. People who may not want to turn the contents of their compost bin with a pitchfork may like a tumbler. With tumblers, you’ll need to regulate your balance of C:N because they tend to retain a lot of moisture, getting sludgy and possibly smelly. Trench composting is when you dig a hole or trench and bury your scraps. 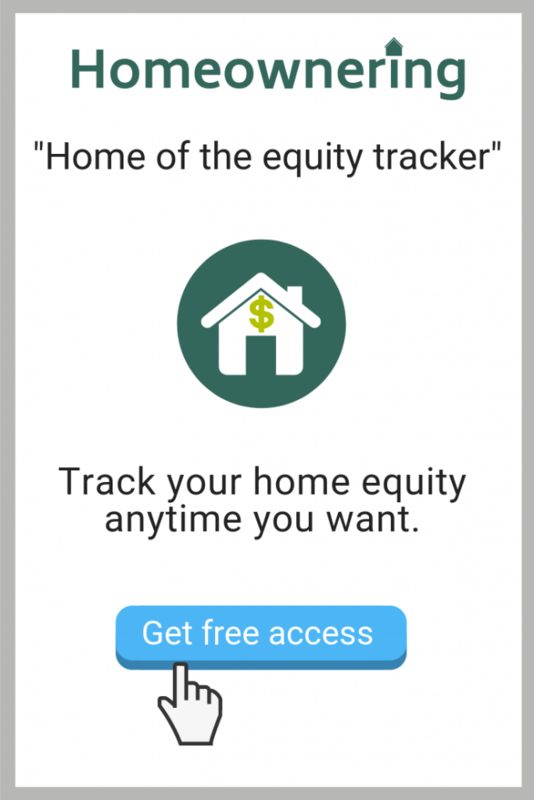 This is good for people who have the room in their yard. You don’t need to be mindful of the ratio of carbon to nitrogen ingredients as you just bury your scraps, just make sure to cover them with 8-10 inches of soil to serve as a pest and odor barrier. The soil ecosystem does the rest. 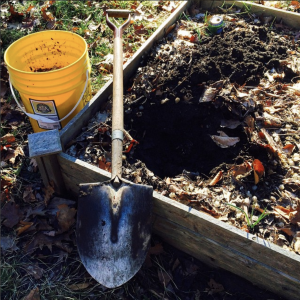 How do you know if your compost is “working”? Ideally, the compost you make should have the dampness of a wrung out sponge and should smell good and earthy like the forest floor. If it smells sour or like ammonia, you have too many wet, nitrogen-rich ingredients and you’ll want to add some carbon rich ingredients, like dry leaves or shredded, non-waxy cardboard or paper. If nothing seems to be happening in your compost pile at all, it may too dry. Add some water or more nitrogen rich material, mix it up, and check on it in a couple of weeks. How do you know when your compost is done? Compost tends to have a neutral PH, and there are different stages of done-ness with composting. 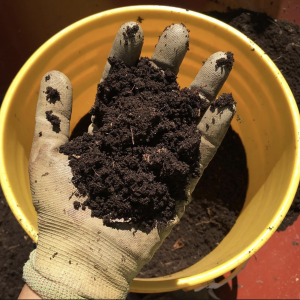 You may think your compost is finished when it looks black and crumbly, however, there may still be microbial activity going on that could affect the PH and how the compost behaves in your soil. A good test you can do to tell if it is really finished is the “sniff test.” Put it in a plastic airtight bag for a few days and then open and sniff it. If it smells like a forest floor it is good to go, but if it smells sour, it isn’t done yet. How much work is composting? 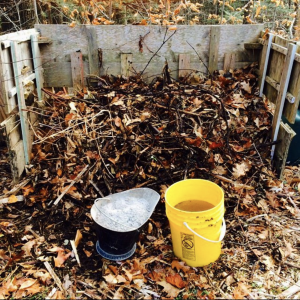 Composting can be as much or as little work as you want it to be. If you want compost faster, you can turn it and adjust the moisture levels as needed. Otherwise, earth worms and other creatures will slowly turn it and break it down for you. They do the work eating up, and pooping out, chunks of organic matter. If you want, you can get really scientific about composting. You can, for example, force “hot composting” with the Berkeley method and can have your compost ready in as little as a few weeks. This method requires a very specific high volume of organic matter in a specific ratio, turned on a regular basis. This creates hospitable high temperature conditions for “hot” or thermophilic bacteria that consume organic matter rapidly. What are some expert tips you can give our readers? Fun fact: compost reduces significantly, up to 90%. So, you may actually never fill a whole bin because it continually reduces over time. Another thing is that people can leave mowed grass on the lawn instead of collecting it, to provide organic material to feed your soil. It may seem lazy to not collect or rake up freshly cut grass, but in fact, by leaving it there, you are a composter! Also, worm poop is highly microbial rich – in fact, it’s considered the crème de la crème of compost. What’s the best way to use your compost? You can sprinkle it on any plants or soil, and top-dress plants. You can also make aerated compost tea, where you put some compost in a nylon stocking submerge it in water, add a fish tank bubbler, molasses or other sugar to feed the growing microbe population. When it’s done, you can spray it on leaves or drench the soil with it to improve soil and bolster root systems. Even if you don’t garden yourself, you probably know someone who gardens — sharing is caring! Use it on your houseplants, or feed a starving street tree! You can also use your compost as a growing medium instead of potting soil. 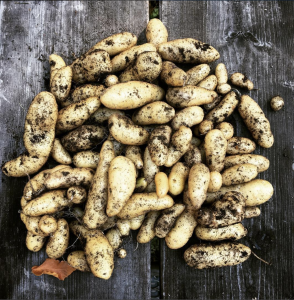 Right now, I’m having a lot of fun growing potatoes in buckets of compost!